Fragilecologies / All Fragilecologies / “International Climate Negotiations (a la COP 15): Playing ‘Twister’ using energy policies instead of colored dots!” Mickey Glantz. 25 December 2009. “International Climate Negotiations (a la COP 15): Playing ‘Twister’ using energy policies instead of colored dots!” Mickey Glantz. 25 December 2009. Have you ever heard of a game called “Twister”? Rows of red, yellow, blue and green colored circles on a plastic sheet about two meters by two meters. That is the playing field. A person (called referee) spins an arrow and it stops on a color, which then causes everyone to contort his or her body to be the first to place a hand or a foot on the circle of that color. The end result, after a few spins of the arrow, is a set of people who appear to have interlocked their legs and arms in a pile of contorted humans. The smallest number playing is two. The largest number of players was reported in the Guinness Book of Records as 20,000 on a twister mat that covered an area the size of an American football field (100 yards or more than 90m in length). The referee spins the spinner, then calls out the body part and the color that the arrow is pointing to. For example, the referee may call out: “Right hand, red.” All players, at the same time, must then try to follow the referee’s directions as explained below. Each player must try to place the called-out body part on a vacant circle of the called-out color. For example, if the referee calls out “Right hand, red,” each player must try to place a right hand on any vacant red circle. If your called-out hand or foot is already on a circle of the called-out color, you must try to move it to another circle of the same color. There can never be more than one hand or foot on any one circle. If two or more players reach for the same circle, the referee must decide which player got there first. The other player(s) must find another vacant circle of the same color. Never remove your hand or foot from a circle, unless you’re directed to by the referee after a spin. Exception: You may lift a hand or foot to allow another hand or foot to pass by, as long as you announce it to the referee beforehand, and replace it on its circle immediately afterward. If all 6 circles of a color are already covered, the referee must spin again until a different color can be called out. As I read about the various climate and energy conferences, workshops, and public statements of top political leaders at summits like the G-20, the G-77 + China, or even within the US government and as I watch the US two Houses of Congress twist and turn to protect the special interests that they represent — coal industry, oil & gas sector, outspoken scientists (true believers as well as skeptics) — I am now convinced that they are unwittingly engaged in a Realpolitik version of the game of “Twister”. Instead of colored circles though, there are various policy options for coping with the causes and consequences of a human-induced climate change resulting from increased amounts of greenhouse gas emissions due to human activities. Positions are bent, twisted, turned, mitigated (e.g., softened), even changed permanently or in flip-flop ways. Negotiations proceed with each player (a country or a group of countries) seeking the best advantage point for itself or his/her country, while at the same time trying to gain advantage over the other players. 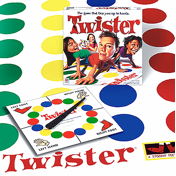 In the game of Twister, there can only be a winner or two, with so many players participating in the game. Where there are winners, losers (absolute and relative) cannot be far behind. So, playing the game requires some level of skill mixed with a modicum of cunning. Those without these attributes are likely to find themselves on the sidelines as observers, having been forced out of the game. An example in my mind of a poor strategy for the climate change political twister game is a fairly recent statement by a representative or two of African countries that if Africa does not get $200 billion a year from the industrialized countries, Africa would boycott the December negotiations in Copenhagen, eg, COP 15. Bad idea. Africa is not, has not been and will not be a major emitter of greenhouse gases. As the victim of the potentially devastating consequences of a human-induced global warming, it will find itself in line with other victims seeking assistance and many would need assistance to cope with climate change well before other (including African) countries, eg, the AOSIS countries, Bangladesh and major low-lying coastal mega-cities worldwide, at risk of inundation resulting from sea level rise. Africa does not have a climate change card to play except in the humanitarian arena and in the UN General Assembly where countries vote on issues. A better strategy is for African countries to find the appropriate level of negotiating points twists and turns to get what it wants without the risk of being sidelined and voiceless. In a game of twister bluffing is a weak option. It may work once or twice, faking out opponents but eventually they become increasingly aware of someone’s propensity to bluff. As in politics, one hopes that eventually words will have to match deeds. Over time if one’s words have not done so, then his/her credibility is lost. Once lost, it is hard to get back. In this regard governments often pledge to do a wide range of good things but in reality it turns out that they often fall well short of their stated (maybe even desired) goals, especially in the absence of mechanisms to verify if pledges have been met. Meanwhile the planet is heating up. No longer do people talk about a 2 deg C limit for acceptable climate change; now they talk of 3 deg C. Today we talk about billions of dollars in the same way we used to talk about millions of dollars, as the worldwide financial crisis ballooned out of control. And now we are starting to talk about trillions of dollars like we used to talk about billions just a year or two ago. It seems that the resolve of governments and of the US Congress is slipping away from finding solutions in the near term to address the increase of greenhouse gas emissions in order to avoid a dangerous changes in the global to local climate systems. It looks as if the climate change twister game runs the risk of having no winners. Nero is said to have fiddled as Rome burned. It seems we have heard about this lesson of history but unfortunately, not to use it as a lesson learned in order to avoid it, but to conscientiously repeat it. So it goes, when human and political nature is in conflict with the natural environment. There are currently 6 Comments on “International Climate Negotiations (a la COP 15): Playing ‘Twister’ using energy policies instead of colored dots!” Mickey Glantz. 25 December 2009.. Perhaps you would like to add one of your own? Not to mention the memorable game lines “”You are in a maze of twisty little passages, all alike” / “”You are in a maze of twisty little passages, all different”–both of which aptly describe COP15 and the bureaucratic labyrinths of climate change negotiations. Sadly, this isn’t a game. It’s the planet. Some day soon, we will find adequate ways to directly acknowledge the global challenges of our times by connecting the colored dots between human overconsumption, overproduction and overpopulation activities on one hand and climate destabilization, natural resource dissipation and and environmental degradation on the other. It seems to me that any “truth” about Earth’s ecology and climate science needs to be coupled with the best available science about human population dynamics and the human overpopulation of our planetary home. Threats to human wellbeing and environmental health cannot be reasonably addressed and sensibly overcome until the root causes of the threats are acknowledged, validated by science, and widely shared in the human community, I suppose. The analogy of the ‘Twister’ game seems quite true from this perspective, and a bit saddening to know that to some extend the players will seek to compromise less, while still seeking their own advantages. I agree with Ilam and Steven’s comments; we know these decision makings and negotiations are not a game. In my mind, furthermore to coupling population dynamics with ecology and climate sciences, I would dwell in the shift in values (i.e. moral values/cultural values) as exemplified in empty bluffs and words that are not backed by deeds… Perhaps our education paradigm should focus on a more ‘consequential learning’, by not just learning concepts, but connecting these into the wider context of earth sciences, traditional practices, history and the consequences our actions bring. But even if modifying or premises was a possibility, I believe the real transmutation would occur by addressing core values. these comments brought to mind what i guess would be a paradox: how to take the politics out of policy making. we know politicians for the most part are often trapped into thinking about short term as opposed to longer term benefits of their decisions. a politician can seek to do the right thing for the future but those supporters seeking short term rewards in exchange for their support of those leaders. what to do? i am afraid i am seeing this in the current US Administration pursuit of longer term benefits for society but with short term adverse consequences in the next elections of 2010. That is a great analogy. There were several African officials or even non governmental organizations that were talking but not playing the game. The representative of the African Union PM Meles Zenawi (Ethiopia) was one of those who bluffed that they will walk out of the negotiations if their demands was not met. However, when the game started he noticed the direction of the game. Africa was being sidelined. He began to play the game and revised his position that was accepted by the industrialized countries. Meles Zenawi stated that he changed his strategy in the climate negotiations “Because we have more to lose, we should compromise and be flexible with (other countries).” Africa was also being sideline and his new proposal brought Africa back to the game despite opposition by some spectators Copenhagen twister game. Meles said this after admitting that his proposals at the U.N. summit fell short of African expectations. You see, now this is something I can relate to. This looks like a lot of fun to me, and to be honest, I wish I was a part of! 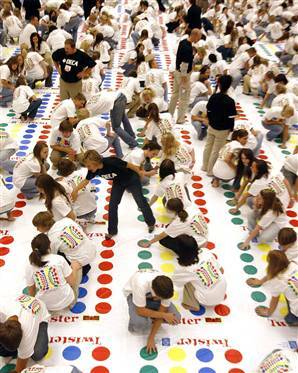 I’ve never seen so many people playing twister at one time! I bet a lot of people were out the first 4 moves! You could start a league, make some printable coupons, and advertise for this, and make a killing off it!